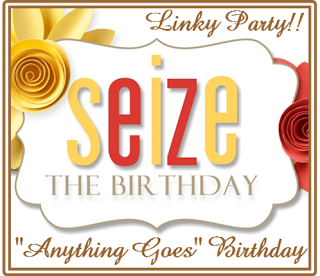 Hello Friends, It’s time for a new challenge over at Seize the Birthday! We have NO topping this time around, so all you need to do is make a Birthday card and or project! You can never have to many Birthday cards lying around, so I hope you join me and my wonderful teammates! If these colors on my card look vaguely familiar to you, then I am here to tell you that your not crazy! I posted a card a about a week ago with these exact papers, I loved the results so much, that I couldn’t wait to try it again! I am pleased as punch once again with the results!! I think it all has to do with the great Verve stamps I used, along with the fun Viva La Verve sketch that was my starting point! The stamps are from the Verve- Poppy Birthday Set. I heat embossed my sentiment and used a white gel pen to add some dots and lines on my poppies and leaves. The vertical circle edge die is also from Verve and is in that 3 Set die– cut pack that I am always raving about. I have all things Verve linked up for you!! The decorative circle die is from Spellbinders and it is also something I adore using! Any other questions, please ask. Categories: Cards | Tags: Card making, Cards, color challenge, Happy Birthday, rubber stamps, sketch challenge, stamping, Verve Stamps | Permalink. Beautiful card and lovely colors. I like all those layers you used too! Beautiful. Love the colors, the layers and everything about your card. 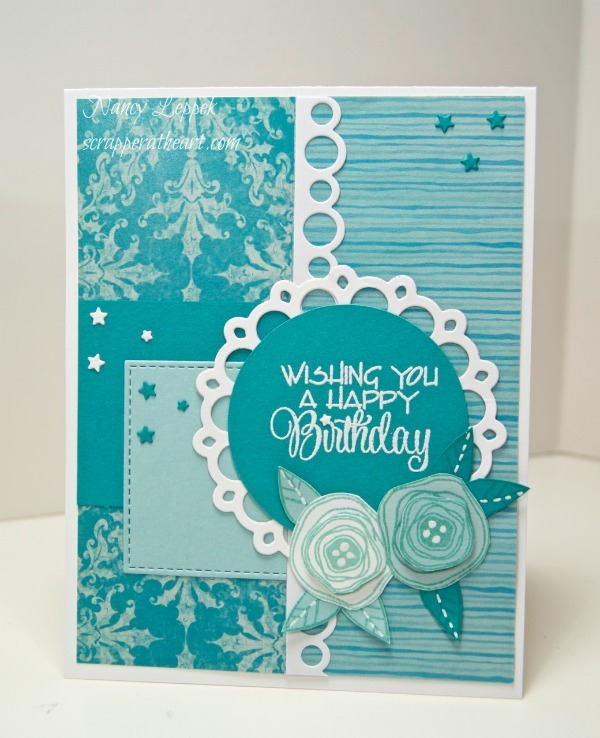 Gorgeous monochromatic card – wonderful images and fabulous layout! I do love a good monochromatic card! The papers are fantastic together and I love how you did all those layers. They would have me stymied for sure! Congratulations on your blog posting milestone. Time flies when you’re having fun! I love the monochromatic tone of your card, Nancy, and those dies are wonderful. Absolutely gorgeous Nancy! Such an amazing monochromatic card. LOVE the little stars.